Is your garden bursting with zucchini yet? 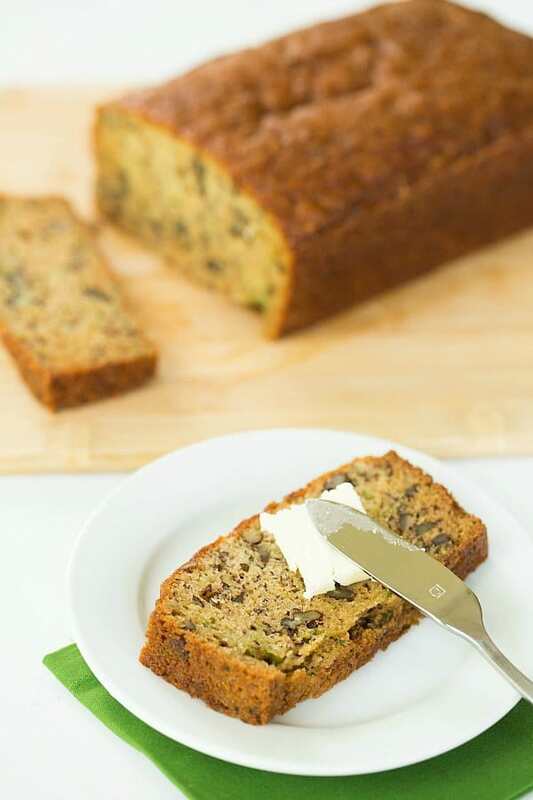 I don’t eat much zucchini in its natural state (you probably know by now that I’m about the furthest thing from a veggie lover that you’ll ever meet), but I do love it baked into desserts and breads. It doesn’t impart much in the way of flavor, but it does a tremendous job of keeping baked goods nice and moist. 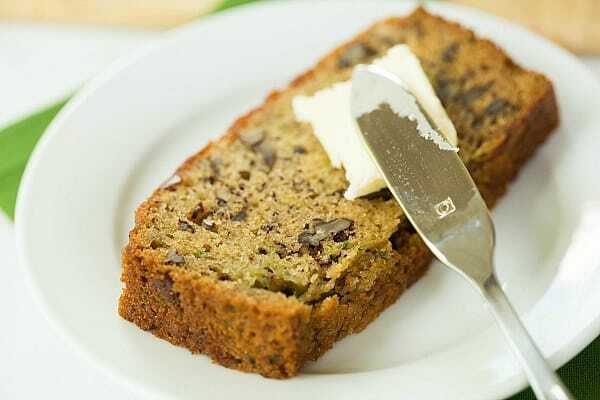 While I’ve tried many different recipes to date, my favorites have to be my grandma’s zucchini-pineapple bread, her recipe for zucchini squares, and this double chocolate zucchini bread that will you have you swooning. I enjoy experimenting with zucchini, so when I came across a recipe for a zucchini-banana bread, I wasted no time in getting it into the oven. 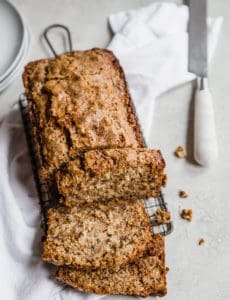 This bread is quite similar in texture and flavor to my grandma’s recipe for banana-nut bread, with the same level of rise and the same type of crumb. 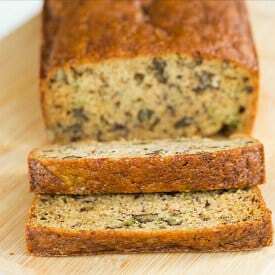 The combination of bananas and zucchini in this bread means that it is supremely moist – a recipe for bread perfection! This bread was made with pecans, but you could use walnuts, or whatever your favorite type of nut is (or leave them out altogether). Do you have a favorite zucchini recipe that you turn to when you have an abundance of zucchini on your hands? An easy way to use up leftover bananas, as well extra zucchini from the garden. Preheat oven to 350 degrees F. Grease two 9x5-inch loaf pans and set aside. In a medium bowl, whisk together the flour, baking powder, baking soda, cinnamon and salt; set aside. In a large bowl, whisk the eggs. Add the sugar and oil and whisk until smooth and combined. Whisk in the bananas and mix well. Add the flour mixture and stir gently with a rubber spatula until no flour remains. Fold in the zucchini and pecans. Divide the batter evenly between the two loaf pans. Bake until a toothpick inserted into the center comes out clean, 50 to 60 minutes. 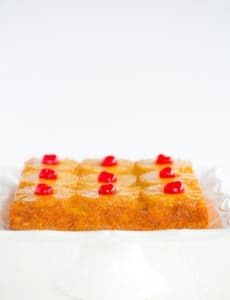 Cool on a wire rack for 10 minutes, then remove the bread from the pans and place on wire rack to cool completely before serving. Wrapped tightly in plastic wrap, the bread will keep at room temperature for up to 5 days. My family loved all. Today was a bake day. Do you squeeze the moisture out of the zucchini or leave as is? 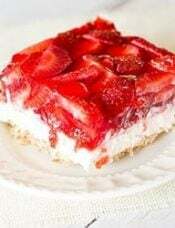 I am interested in trying this recipe due to the Greek yogurt as one of the ingredients. Might vanilla also work and then reduce the sugar a bit? Hi Deb, Yes, squeeze the moisture out, sorry that’s not specified above. I made this last night and it was a hit! I replaced the vegetable oil with 1/2 cup avocado oil and 1/2 cup coconut oil. I also halved the sugar. It was plenty sweet and tastes so delicious spread with butter. Yum! I made this last nite, except I used 1/2 c butter and 1/2 c coconut oil (all ingredients need to be at room temp else the coconut oil will solidify) and approximately 2c zucchini, 4 bananas, 1 1/2 c real cane sugar and 1/2 c brown sugar, 1 bag chocolate chips, 1 c pecans, and 1/3 c plain yogurt and voila…party in our mouths! *The only thing I would do differently is spray the pan and lightly flour! It kind of stuck on the bottom…but not very badly. Can I freeze this bread, and for how long if it’s possible? Thank you. Hi Yelena, Yes, definitely! You could freeze it for up to 1 month. I had too many zucchini and didn’t know what to do with them. 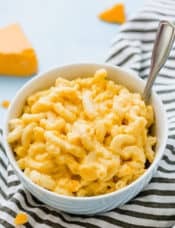 I found this recipe and tried it out, however I made muffins instead of a loaf. They turned out fanatic! They’re a tad sweet but the crispness of the zucchini is a nice surprise. A wonderful breakfast muffin! I baked 24 muffins for about 18 minutes at 350. 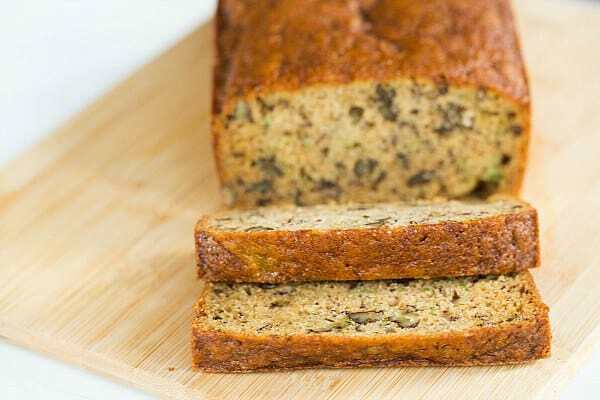 This recipe is awesome, I was trying to decide what I was going to do with all the loaves of zucchini and banana bread and then I stumbled on this. I added chocolate chips and made into muffins for easy treats! The kids love em! This recipe is great as is, but I’m trying to bake with as little sugar as possible. The second time I made it I cut the sugar to 1 cup and increased the banana to 1.5 cups and used melted coconut oil instead of vegetable oil. This is now one of my regular summertime baking recipes. Thanks! i started volunteering at a senior centre (kitchen) last week and it was my job to make muffins today. i remembered making this loaf last year, so i suggested this recipe and the chef approved so i doubled the recipe and made into muffins. the kitchen staff approved my choice when it came out of the oven, yumm!! 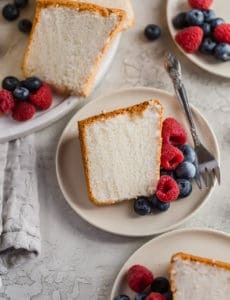 Could I possible cut this recipe in half in order to just bake one loaf? Hi Viktoriya, I think this could be halved without a problem. Enjoy! Is there anyway or what can I use in place of the oil?? Hi May, You would need to substitute another fat. 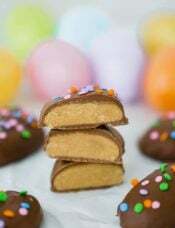 I have not tried these, so I can’t vouch for how substituting may affect the bread, a couple of common replacements for vegetable oil are coconut oil and applesauce. I made these today as muffins, they turned out wonderfully! I followed the recipe as written, but baked at 350 for 23-25min for regular size muffins. I should add that the recipe as written made 30 muffins. I just made this yummy bread. I one and s half times it and got nine mini loaves. Baked about 35-40 min. Followed exactly and did add some nutmeg. 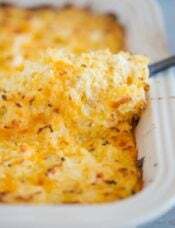 Great recipe and will mske again and again. I never go wrong when I use one your recipes! 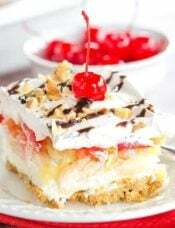 I’m making this right now! Very excited to try. Thanks! 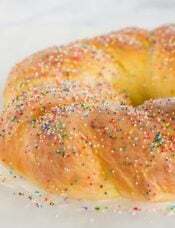 I am going to make this yummy looking bread this weekend. But I would like to make mini loaves. How many do you think this recipe will make and long to bake them? Hi Robin, It all depends on the size of the miniature loaves; I’ve been many varying sizes. sorry about that. They are the foil minis 5x3x2 if that helps. I should probably just check on time but not sure how much to fill them. how much does this rise? Hi Robin, It’s not very high-rising. I hope that helps!